Komfortowo Świętojańska Gdynia, Hotel Poland. Limited Time Offer! Located north-west, 4Read more minutes by car distance from the city center, this hotel at Świętojańska 92/94C is the ideal pied-à-terre to take advantage of all the wonders of Gdynia, whether for a few days or for a longer stay.With a 1 room capacity with categories ranging from the Room to the Room) rooms, the Komfortowo Świętojańska is accessible starting at 530 US Dollars.Of a Family category, the Komfortowo Świętojańska has all the comforts such as : Free Parking, Fully Non Smoking.For those going to the airport, Lech Wa__sa is 10 miles from the hotel which is about 32 minutes by car.High speed internet is available in this hotel.Practical information:This hotel has a free parking. 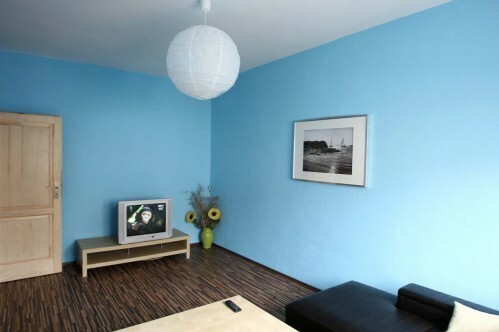 Komfortowo ?wi?toja?ska is situated in the centre of Gdynia, 15 minutes’ walk from the beach. It features a fully equipped kitchen and a TV. Wi-Fi is free on site.